While neutrals are always awesome in my books, there’s no denying that a pop of colour can add a whole lot of “oomph” to any sartorial ensemble!! This juicy apple green is a personal favourite of mine; and since our weather continues to be quite mild here in Vancouver, I was really happy that I could wear my mohair sweater as an outer layer today…rather than hide that fluffy cuteness under a jacket!! But I did go with a little “something something” under my sweater…in the form of a flowy, reptile-print blouse!! My first instinct was actually to go with a more body-skimming layer – to balance out the chunkiness of the knit – but I’m glad I opted to experiment; I love the way the sleeves and hem of the blouse add an extra bit of movement to this look!! And how about you, dear readers…have you done any experimenting with your outfit combinations lately?? I hope you’ll take a moment to share!! What a great layering idea! I forgot to mention what a stunning view your new house got. Love it! Aaaaabsolutely loving the blouse/sweater combo, Monika – and isn't it a beautiful green?! Your pictures are great, you can't tell that you've switched from photographer to tripod! Hope you feel a lot more settled in now in your new home – I'm very envious of those views from your balcony!! 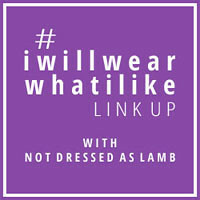 Hope to see you at the #iwillwearwhatilike link up, it's now live! Monika, I have to say, that shade of green is perfect on you! Those sandals are adorable! What brand are they?